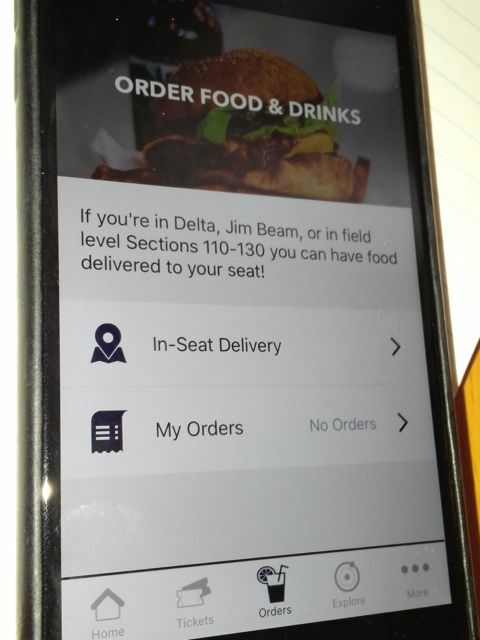 Fans in some areas of Yankee Stadium this year can now order food and beverages for in-seat delivery, thanks to a new stadium app developed with technology from VenueNext, the app developer behind the San Francisco 49ers’ Levi’s Stadium app. Though the app isn’t part of the Major League Baseball official and approved game-day and stadium apps, it does offer most of the bells and whistles VenueNext developed for the Levi’s Stadium app, including digital ticketing, live wayfinding maps and public transit information. According to John Paul, the CEO of VenueNext, the food ordering option is now available to approximately 10,000 seats in the 54,251-seat Yankee Stadium, home of the New York Yankees and also the home to Major League Soccer’s New York City Football Club, which also uses the new app. The VenueNext app comes courtesy of a deal struck last year between Legends Hospitality and VenueNext, to use VenueNext app technology at Yankee Stadium and at AT&T Stadium, home of the Dallas Cowboys. 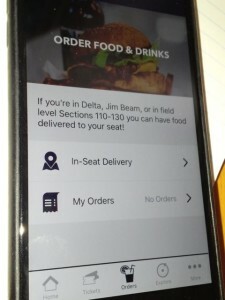 The Yankee Stadium app from Legends is the third major-league sport to use VenueNext technology to support in-seat food and beverage delivery, following the Niners’ app at Levi’s Stadium and an app for the Orlando Magic at Amway Center that debuted during the present NBA season. In a phone interview with VenueNext’s Paul, he said that in Orlando the Magic started out with limited in-seat delivery, ramping up to offering it in the full lower bowl of Amway Center by the end of the regular season. 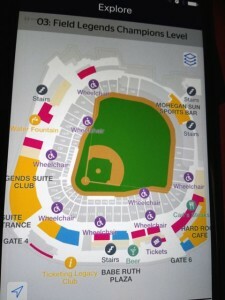 According to Paul, the Yankees are using Aruba beacons to facilitate the wayfinding feature of the VenueNext app maps, and are using VenueNext’s Kezar ticket scanners to support digital ticketing. The Yankee Stadium app, however, does not yet support the ability to order food for express pickup at concession stands, Paul said. The emergence of a VenueNext app that delivers capabilities not found in the so-called Official Yankee Stadium App raises some questions about whether or not the Yankees are playing ball with Major League Baseball Advanced Media’s strategy of having one single app for every MLB ballpark. 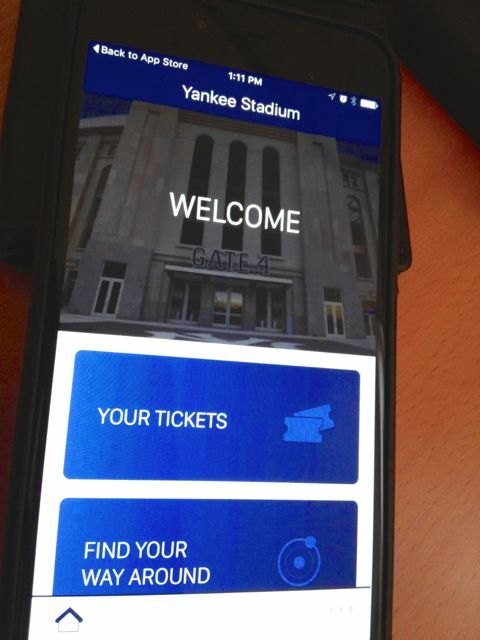 MLB’s Ballpark app, for example, at Yankee Stadium offers “mobile check-in, social media, offers, rewards and exclusive content,” according to MLB. That’s a little bit different than the version of At Bat offered for the San Francisco Giants, which offers mobile ticketing support, seat upgrade options, and mobile food ordering. Other versions of Ballpark, for example for the Chicago Cubs and the Washington Nationals, offer fewer options. 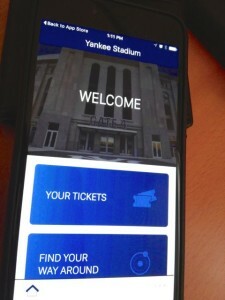 But as far as we know, there are no other MLB teams with a companion app like the VenueNext app for Yankee Stadium. For both the Yankees and the Giants and all other teams, the MLB’s At Bat app offers live MLB content for a fee. There is also no link to the new VenueNext app from the Yankees’ team website, and the VenueNext app does not contain any live content or replay options, features found on both the Niners’ and Magic’s apps from VenueNext. The Yankees have not yet replied to requests for information about the app and whether or not there is any public-facing Wi-Fi yet in Yankee Stadium. Though MLBAM spent some $300 million last year to bring Wi-Fi and cellular DAS deployments to all MLB stadiums, Yankee Stadium was never confirmed to have had public Wi-Fi installed. Repeated requests to MLBAM asking about the Wi-Fi situation at Yankee Stadium have also not been returned. How can the service be so unacceptable that my children don’t want to come back to see their favorite team? Similar experience with me. We waited for 50 minutes, then checked the App and noticed that it said the food had already been delivered. Don’t know what seats it was delivered to, but our seat info was accurately recorded when we placed the order. I guess the service has not improved although, after having to track down an on-site manager to register a complaint, she did issue us a credit.